Holy smokes, dolls, yesterday was an ACTION PACKED day! Tri inside Tuesday, followed by 90 mins of Bikram yoga, and THEN a 6 mile leisurely bike ride. I burned over 2,500 calories. Ridiculous. 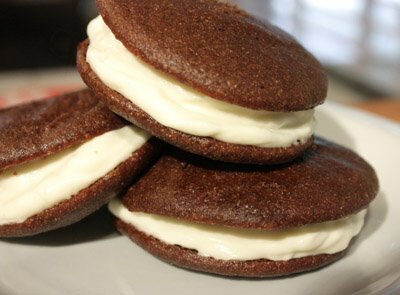 and enjoyed homemade whoopie pies at home. Bikram was....interesting. I had put off trying one of these classes due to the 105 degree temperature, and the sweat. Oh gosh, the sweat! Y'all, I am a sweaty girl by nature. Whenever I run, cycle, walk up stairs, pretty much anything active, I sweat buckets, so getting me to do complicated stretching in a very hot room is asking for trouble. I had also imagined the temperature to be the kind of "can't breathe" heat, and it scared me because 90 degrees in California makes me a cranky pants, what would 105 do? I was surprised, not pleasantly, but surprised nonetheless by the class. The instructor was this young Indian man who was built like a 12 year old boy and had the best accent. I kept hearing "keep your palms by your solar, by your solar", late into the class I realized he meant "shoulders". I did sweat buckets, and it was super hot, just not unbearable, and I made it through all 90 minutes without wanting to die or at least leave the room. I was able to touch my forehead to my knee, something unthinkable without the heat to loosen my stiff triathlon trained muscles. Best part? Bikram burns 630 calories per hour, so at 90 minutes I burned 945 calories. Insane. I bought 2 classes when I signed up, so I at least have to go back one more time. Not sure I would buy more after that, but it was definitely worth checking out! Hope you are having a great hump day! Here's to two more days of freedom for me, and two till Friday for you! 945 calories? Holy moly, that sounds intense. I want to try it! I've done hot yoga once, and it was so intense. But you feel SO GREAT afterwards. You have been busy!! So jealous!! I LOVE hot yoga also! I find that going into the studio at least 10-15 minutes before the class starts helps me acclimatize. I also sweat buckets! That foods looks and sounds delish! I heart artichoke!